MyGica has announced their first Octa Core Android 6.0 TV box. 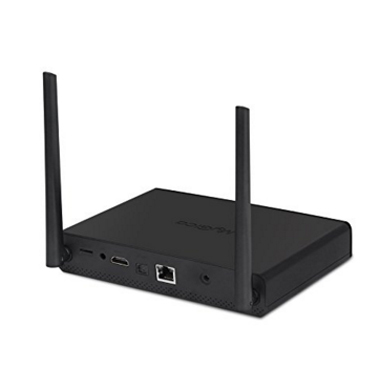 The ATV1960 build with a powerful Arm Cortex A53 Octa Core CPU witch is design for high performance 4K OTT/IP Box. ATV1960 is capable of decoding 4K resolution video at 60fps, supports all major video formats including VP9-10, H.265-10, H.264, AVS, WMV, MVC and more. ATV1960 comes with 3GB DDR4 RAM, 16GB memory, HDMI2.0a and HDCP2.2 support, internal 2.5″HDD slot, Gigabits Ethernet, 802.11AC dual band WiFi and bluetooth, all these leading technologies fresh up Android TV to the next level. ATV1960 build with a octa core processor and Mali-T820MP3 CPU, combine with Android 6.0 OS gives you fast, stable and smooth control experience. ATV1960 supports 4K ultra HD resolution, advance HDR10 processing. Lets you enjoy incredible picture quality and dramatic detailed ultra HD videos. 3x Faster Wi-Fi speed than Wireless-N Wi-Fi, 150% wider/Ultra-wide coverage for large homes and multi-floor location. Extremely fast and stable for local network video streaming and Ultra HD streaming. Kodi, formally known as XMBC, is a media player platform that allows users to play and view most videos, music, such as podcasts from the Internet, home network and all common digital media files from local and network storage media. MyGica Andoid TV Platforms / Solution benefit from MyGica`s a worldwide secure online update service, to warrant and to run always the latest, saves and greatest Firmware and Application which are available. MyGica™, an expert in TV products, delivers the consumer the ultimate experience of watching TV on PC. You will be able to capture, convert and watch your favorite programs whenever you like. MyGica™ is an engineering-driven company with a strong Commitment to design, development and producing.MyGica™, the global digital video device brand. Over these years, MyGica have been sold all over the world. Till now, MyGica brand have been developed all around the world, including Hong Kong, Australia, Thailand, India, Iran, German, United States, Mexico, United Kingdom, Argentina and Brazil. MyGica’s Products including Android TV, TV tuner stick, TV tunecard, PC to TV devices, Video Adapter Devices, Video Converter Devices, HD Media Player, Portable TV, etc. CopyRight © 2008-2018 MyGica ® All Rights Reserved.